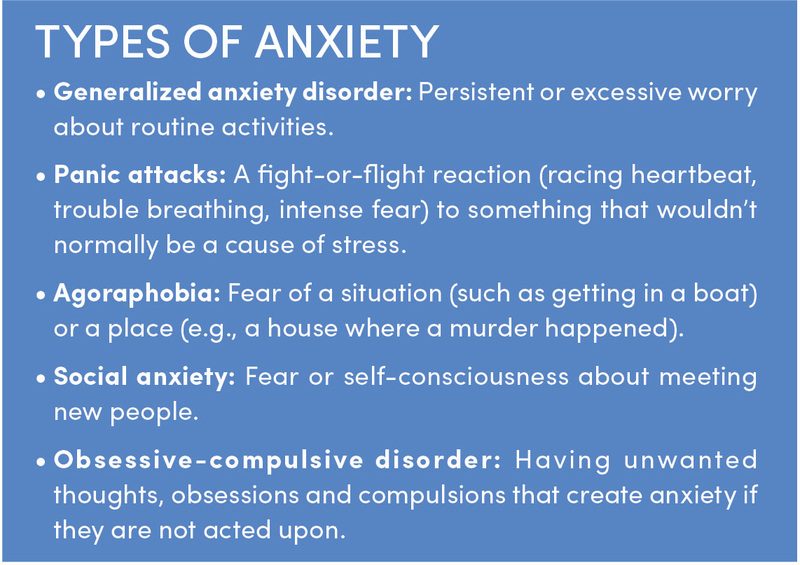 Anxiety presents itself in many different ways—it can be mild or it can be so severe it interferes with your everyday life. One of the unique things about anxiety is that there are a myriad of ways to cope with it, from taking medication to avoiding alcohol and caffeine. When it comes to relieving the symptoms of anxiety, the biggest cure may not be in a pill bottle, but rather in making sure that you’re not bottled up yourself. Mild anxiety can be treated by talking to a mental health professional, such as a therapist or psychiatrist. Research shows doing therapy for six weeks is 60 to 70 percent successful, and it’s 90 percent successful when used together with prescribed medicine. In some cases, medication is necessary for managing anxiety, and that’s not a bad thing—your doctor will prescribe a drug that best matches your symptoms, so you can be well on your way to a worry-free life. If therapy or medication isn’t the answer for you, there are other daily tweaks you can make to relieve stress. Exercise is one of the best ways to keep anxiety in check. When you break a sweat, your brain releases endorphins, which are the feel-good chemicals that keep you happy. In addition to exercise, two of our favorite coping mechanisms are laughing and meditating. With meditation, there’s more than one payoff. Meditation not only preserves memory-related functions, it also reduces stress, which can prevent anxiety. To meditate, all you need is a quiet room. With your eyes partially closed, focus on your breathing and repeat the same word or phrase over and over again—like “om” or “one.” The process of repeating the same word helps clear and relax your mind, exerting an overall positive effect on your health. What you are really doing when meditating is controlling chemical messengers in your brain. Also, some studies have shown that avoiding caffeine, alcohol and tobacco products can be beneficial for people who suffer from anxiety, even in minor cases. So if you struggle with anxiety, try cutting these things out and see if your symptoms improve. By exercising daily, laughing, meditating and avoiding certain triggers (such as caffeine and alcohol), you will have a regimen that should reduce your anxiety and improve your overall health.